Home EDUCATION MTAANI NEWS Kiambu to give free tree seedlings to residents in a bid to achieve its 2022 forest cover target. 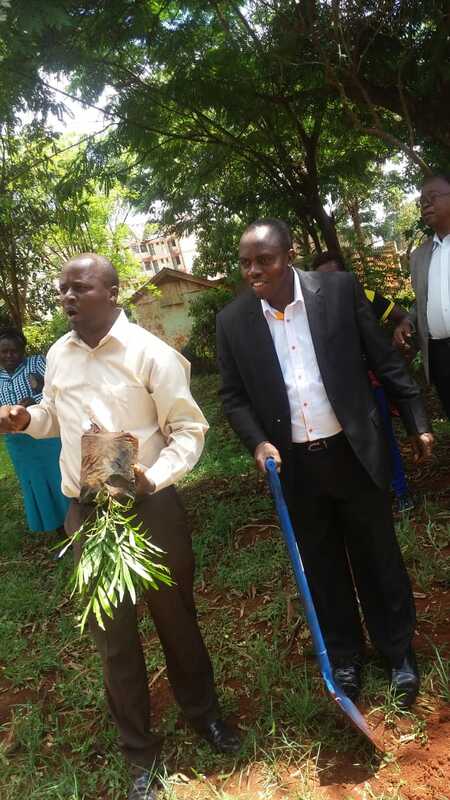 Kiambu to give free tree seedlings to residents in a bid to achieve its 2022 forest cover target. Thika Sub-County Forester Mr. Simon Chege addressing participants during a tree planting exercise by Equity Bank’s ‘Wings to Fly’ scholars at the historical site Mugumo Gardens in Section 9 Estate Thika. He is flanked by Thika Branch Equity Senior Business Growth & Development Manager Mr. Sammy Karanu. Kenyans have been encouraged to take advantage of the ongoing short rains and plant more trees in their homes and surroundings in a bid to save dwindling green cover and ensure an increase in forest cover which has suffered tremendously as a result of wanton felling of forests. This message was delivered by Thika Sub-County Forester Mr. Simon Chege during a tree planting exercise by Equity Bank’s ‘Wings to Fly’ scholars at the historical site Mugumo Gardens in Section 9 Estate Thika. Chege said the County Government of Kiambu had taken this initiative very seriously and encouraged more and more people to join. “Currently Kiambu is leading in tree planting with a forest cover of about 16% and we are targeting to hit about 20% by the year 2022. To achieve this, we are encouraging more and more people to plant trees in their homes and even on public road reserves and we are ready to give out free seedlings to all those who want to support the exercise,” said Chege. The country’s forest cover currently stands at 8% and it is expected to reach 10% by the year 2020. On behalf of the Equity Group, the scholars and members of the Thika East and West sub-county Community Scholar Selection Board (CSSB), Thika Branch Equity Senior Business Growth & Development Manager Mr. Sammy Karanu lauded the ‘Wings to Fly scholars’ for taking up the initiative to plant trees which he admitted, can make a big difference in reclaiming the country’s forest cover. 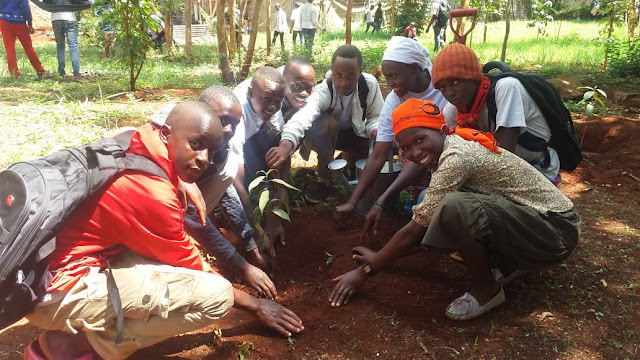 About 200 scholars who are beneficiaries of Equity ‘Wings to Fly’ programme from both Thika East and West sub-counties planted indigenous trees in the event dubbed “Tree is Life”. A section of Equity ‘Wings to Fly’ scholars drawn from Thika East and West Sub-Counties planting a tree at Mugumo Gardens Thika. They were joined by Equity staff, CSSB members, and staff from the Kiambu County Environment and Forestry departments. It is named after the giant fig tree, which had a 15-foot diameter, where the ancient legendary seer Mugo wa Kibiro prophesied. Believers claim that all of his prophesies have come to pass. According to legend, the fall of the tree would symbolise the fall of British rule in Kenya. The British Government reinforced the tree to prevent it from falling, but it split into two parts and fell in two stages in 1963 in the months of May and November, 1963.